A German national suspected of advising the Taliban was arrested by Afghan commandos in Helmand province, Feb. 27, 2018. The Afghan Ministry of Defense confirmed Thursday that a video circulating on social media of a captured foreign fighter in Afghanistan’s southern Helmand province is authentic and the suspect is a German national who has worked for the Taliban for more than eight years. "Monday night, our commando forces arrested three suspected insurgents, two Afghans and one German national during a raid in Grishk district of southern Helmand province," Defense spokesperson General Dawlat Waziri told VOA. "They had weapons, ammunition and military gear in their possession," Waziri added. Helmand provincial police officials say the alleged German national, whose identity has yet to be revealed, was a Taliban adviser in southern Helmand province for the past year and was arrested during a raid on a suspected Taliban bomb-making compound. "The German national was serving as an adviser to Taliban’s Red Unit [Taliban Commando] in southern Helmand province," General Mohammad Dawood Tarakhil, an Afghan local police chief, told VOA. Provincial officials said the suspect would be interrogated about how he ended up with the Taliban. Omar Zwak, Helmand governor’s spokesperson, told VOA the suspect was transferred to Kandahar for further investigation. 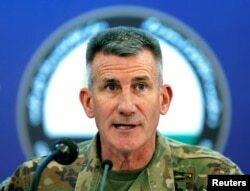 An Afghan general from the 215 Corps told BBC that the suspect is in U.S military custody in southern Kandahar province. However, Army Captain Tom Gresback, a spokesperson for NATO Resolute Support Headquarter in Kabul, said he could not confirm the suspect was being held in U.S. custody and directed further inquiry about the issue to Afghan authorities. Neither the German government nor German forces serving under the U.S.-led NATO mission has commented on the news. Afghan security officials claim foreign fighters are present in the ranks of the Taliban and Islamic State terror groups. "We have long been stressing that foreign terrorists are helping Afghan militants wage war in Afghanistan," Waziri said. He said foreign militants fighting alongside the Taliban and IS in the country include Uighurs, Chechens, Tajiks, Pakistanis, Arabs, French and Algerians. Afghan officials claim that most fighting in the ranks of the Islamic State in the country are foreign nationals. FILE - U.S. Army General John Nicholson, commander of Resolute Support forces and U.S. forces in Afghanistan, speaks during a news conference in Kabul, Afghanistan, Nov. 20, 2017. Last month, General John Nicholson, commander of the U.S.-led mission in Afghanistan, told a press conference in Kabul that currently there are about 1,500 IS fighters in the country. "We have cut their [IS] numbers in half over the last two years. We have killed their amirs’ (chiefs), we have reduced their territory, again, we have driven their fighters out of parts of the country," Nicholson said, rejecting claims made by Russian officials that there are thousands of IS fighters in Afghanistan. The American general added that IS militants are operating in parts of the eastern Afghan provinces of Nangarhar and Kunar and maintain a pocket in the northern Jowzjan province.